Confession time. I've been much more interested in scissor-collecting than stitching or designing lately. However, it is getting more and more difficult to find scissors I don't already have so I guess that will have to go on the back burner for awhile. 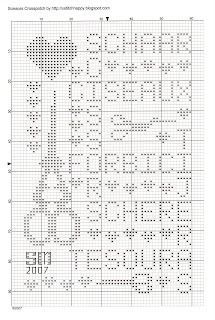 So today's chart is a combination of recent interests - scissors, cross stitch, designing and monochromes. I never was very interested in monochromes in the past because I love color - lots of color! But lately, I've become quite fascinated with the complex simplicity of the designs, if that makes any sense. To convey the beauty of the picture without using color for detail and shading is amazing to me. And, of course, with all the beautiful threads and fabrics available today, there is plenty of opportunity to incorporate color and still maintain the monochrome simplicity. I am quite pleased with this chart which is surprising because I'm my own worst critic. I just finished the chart this morning so it hasn't been stitched yet - I hope to start it this evening when I get back home. The words are "scissors" in seven languages and I'm sure I'm not the only stitcher out there that loves and collects embroidery scissors. I wanted to share my version of Swirly Autumn. You can find it on my blog at . Thanks for the great design! Merci, merci beaucoup !!! Superbes vos grilles !!! Thanks, Christine! I hope you will give me permission to post your picture and floss changes of your version of Swirly Autumn here on my blog - please let me know! Hi, I wanted to let you know that I enjoy your blog and to thank you for your lovely designs! What is the source of the dragonfly design you used for the fob in the picture posted back in March? It's very pretty! Sharon this is a great design. I look forward to seeing the finish piece. I want to try some of your other designs. Karen, the dragonfly design is adapted from Dragonfly Jewels by The Cat's Whiskers Design Studio. I changed the threads and colors and left off all the partial stitches - I'm not sure what else I changed as that was several months ago. It turned out bigger than I liked but I loved it on that fabric so I have redesigned my own version of it to be smaller and will post it here soon. Do you have the ones shown here, with the Seahorse?